Market growth and strategy development were the major challenges facing global senior business executives in 2017. However, looking ahead over the next three years, changing priorities will bring a greater emphasis on cybersecurity and digitalisation of business processes. The findings were uncovered in this year’s Corporate Learning Pulse, a major leadership study conducted on behalf of Financial Times | IE Business School Corporate Learning Alliance. Attitudinal research was conducted among almost 1000 senior executives working across multiple business sectors in China, Denmark, France, GCC countries of the Middle East, Germany, Japan, Netherlands, Spain, Sweden and the UK. 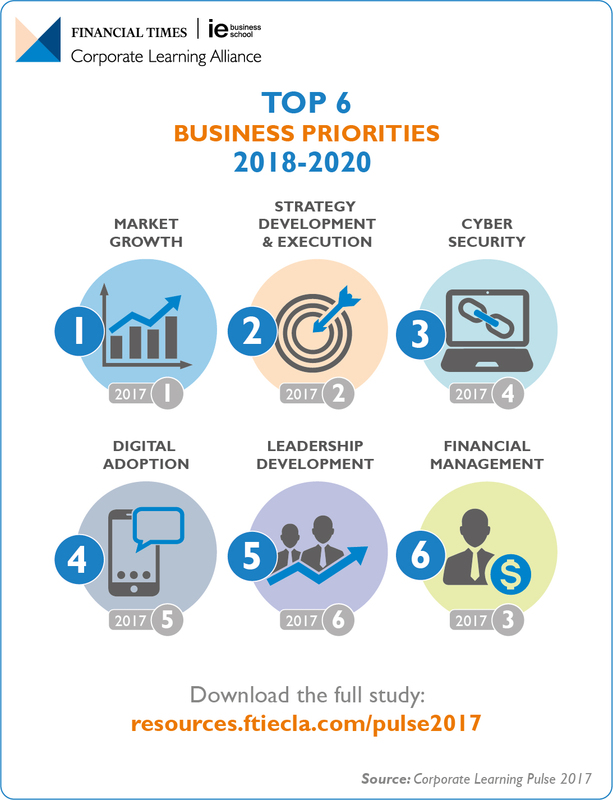 While the top three business priorities for 2017 were growth, strategy and financial management, by 2020 the war on cyber-attacks, and the accelerating impact of digital disruption, will bring them higher in the list of concerns for senior executives. The dominant fear for companies citing cybersecurity as one of their top concerns is, unsurprisingly, hacking and potential threats from hackers. For executives facing the effects of digital disruption, the cloud and the growing impact of technology in general are the top issues. Here, global differences are revealed in the study: executives in China and the Middle East are twice as likely to put digital adoption among the top three issues they expect to tackle over the next three years, compared to their European and Japanese counterparts. The study also focused on attitudes to leadership development and what executive education can bring to business strategy. The need to improve management abilities, and address staff retention and development, are the highest priorities for corporate learning over the next three years. Among the companies surveyed, executive education is seen as less of a route to managing digital adoption. However, when asked which elements of digital strategy are most important, the understanding of data and analysis of trends ranked highest. There is a clear role here for executive education, according to FT | IE Corporate Learning Alliance. While, traditionally, it is seen as a route to leadership development in a broad sense, corporate learning can also place a stronger focus on real-world business challenges. From the findings of this leadership study, a better understanding of the impact of digital adoption must become higher up the agenda for HR and Learning & Development professionals in the next three years. The 2017 Corporate Learning Pulse global survey report and a video summary of the 2017 findings are available here. About the Corporate Learning Pulse Survey This year’s survey is the second in a series of annual surveys of ‘C-suite’ executives, HR and L&D professionals in a range of countries around the world. The 2016 survey encompassed some 600 business leaders across Western Europe. The 2017 survey, of some 939 executives, gathers opinions from Western Europe, the Middle East, Japan and China.